and yes, she has already knit something else out of the same skirt… then we went thrifting again and found a fine merino sweater and a fine cashmere sweater that are already unraveled and awaiting being held together to be made into a shawl. that’s my kind of vacation. This entry was posted in community, knitting, the fam by cosymakes. Bookmark the permalink. I always bring my knitting to baseball games! I get great comments from secret knitter baseball fans without the foresight to bring their knitting to the game. It is the first thing I pack! 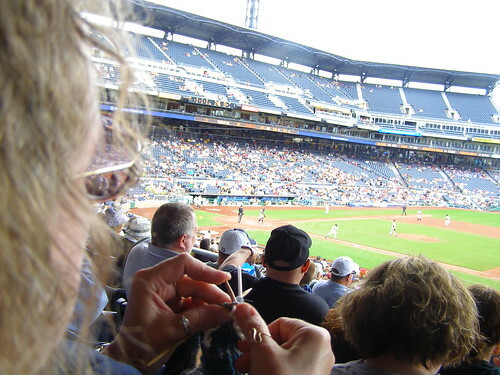 I have not yet knit at a baseball game… Something to look forward to trying out!